Indonesia is an immense country, and each of its islands is unique. I’ve only been to two — Bali and Gili Trawanagan (affectionately known as Gili T). Bali is getting spoilt … while you can still find the “real Bali” in a few places, the main sites are very crowded and very touristy, and I don’t just mean Kuta. I found the touts on the streets to be particularly relentless; the only place I’ve seen worse is in northern Viet Nam. In Ubud it is a little nicer, as most of the taxi touts will just hold up a sign asking you if you want a ride, rather than follow you down the street as they do in Seminyak, for example. I was also a little disappointed in the beaches in Bali. It depends on the time of year that you go, but in March there was a lot of runoff from the heavy rains, and that meant the sea was a little dirty with floating garbage (not with worse, I hope). The current is strong at Seminyak, so not the best for kids. Families tend to prefer Sanur, but keep in mind the tide goes waaaaay out here, so wading is fine, but swimming less so. Ubud is a can’t miss on a visit to Bali, but everyone else knows this too. My advice for Bali is to stay outside the main touristy spots, and take day trips to see the highlights. Here’s an overview on where. Spend as much of your time as you can near the rice fields — they are spectacularly green — and talk to villagers. The Balinese culture is lovely. Need to know — Balinese culture (for LuxuryAndBoutiqueHotels.com). Review of Villa Sungai for LuxuryAndBoutiqueHotels.com: in a real Balinese village in the south of Bali, Villa Sungai is one of the finest hotels in the world and is one of LuxuryAndBoutiqueHotels.com’s Top 8 Worldwide Hotels. Villa Sungai feature for Luxury Travelers Guide. 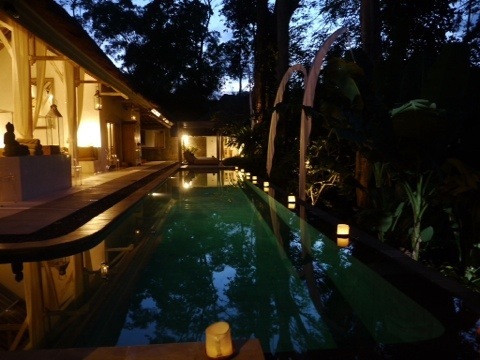 Review of Chapung SeBali for LuxuryAndBoutiqueHotels.com: just outside of Ubud near the village of SeBali, this luxe eight-suite villa hotel features immense villas with private pools. Review of Mahagiri Villas for LuxuryAndBoutiqueHotels.com: in Sanur, a villa hotel designed for privacy — have breakfast delivered to eat beside your private pool! Review of Pondok Ayu for LuxuryAndBoutiqueHotels.com: also in Sanur, a five-room boutique hotel very popular with families and returning guests. Review of Villa Kresna for LuxuryAndBoutiqueHotels.com: near the beach in Seminyak, Villa Kresna has a hotel and a villa location, and both are surprisingly quiet for such a busy town. Gili T is the largest and most popular of the three main Gili islands (“gili” means island). The other two are Gili Meno and Gili Air. While Gili T has a reputation as a party island, this is changing and there are several places to stay on the northwestern part of the island that are quiet. I’ve written It’s Time for Upscale Travellers to Discover Gili T for LuxuryAndBoutiqueHotels.com which gives restaurant advice too. These islands have some great scuba diving and it is some of the least expensive in the world. If you want to learn how to dive, or take specialization courses, Gili T is the place to do it. The dive shops all work together to protect the reefs and have set prices, so there is no price cutting (and therefore safety risks). If swimming or snorkelling off the beach is important to you, you need to pick your spot carefully. While the sunsets are absolutely spectacular, the water on the western side of Gili T is generally too shallow for swimming. On the northwest and northern sides, you can’t swim well at low tide, and at other times of the day you’ll need to walk out about 30 meters before water approaches swimming depth. Do make the effort though, as there is some fantastic snorkelling off this part of the island, including big turtles. The water on the southern part of the island is deeper (the boats are all anchored here) and the sand softer. This is also “downtown Gili T” and the road along the beach is packed with shops, restaurants and accommodations in a range of quality. You might want to bring reef shoes — Gili fisherman used to use dynamite for fishing, destroying a lot of the corals off the island. They are in much better shape now, but much of the dead coral is is small pieces along the water’s edge. It will gradually break down, but until then bathers walk gingerly over it in many spots on the island. My overview of Gili Trawanagan should help you decide if this is the right Indonesian island for you. Review of Wilson’s Retreat: A top notch boutique hotel on the quietest part of Gili T, with fantastic food. Review of Hotel Ombak Sunset: Best sunsets on the island at a wide beach; while the water is too shallow for swimming, the hotel makes up for it with the biggest pool on the island. Review of Villa Grasia: A small boutique hotel great for families. Great snorkelling offshore. I was trying to decide on a trip to Thailand or Indonesia for my honeymoon, and thanks to you I’m choosing Indonesia! Villa Sungai looks awesome too. You will very much enjoy Villa Sungai — it is the perfect place for a honeymoon, Allison! Thailand is lovely too, but Indonesia is really unique from island to island. I’ve only seen a small portion of the country, but hope to explore more soon. I’m afraid I didn’t try surfing while I was there, so I’m not the one to trust for that information. I did see a large number of surfing schools advertised though. Have fun!